Posted on October 28, 2011 by Eastwood Eagles | Comments Off on Monday is Spirit Day! Monday we celebrate our second Spirit Day of the year. Wear your spirit colours or wear orange and black. Our assembly will recognize Respect and Courage! Join us at 9 am for the celebration. Comments Off on Monday is Spirit Day! French Literacy Cafe a hit! 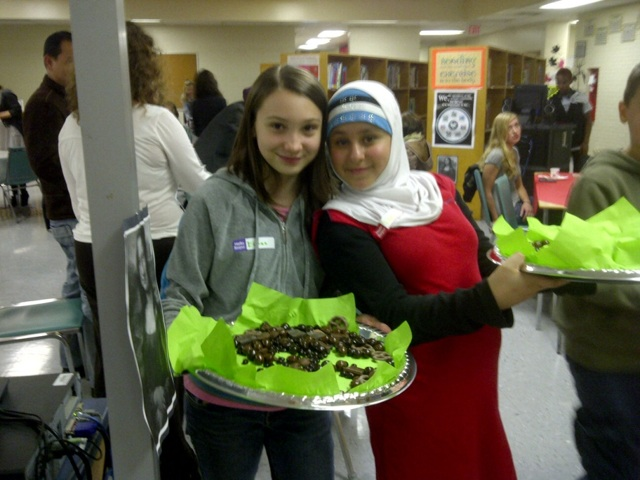 Mlle Feghali and many Eastwood students hosted a fantastic cafe incorporating French literacy and delicious snacks. Proceeds went to the grade 8 graduation fund! UNICEF Penny Drive at Eastwood! Posted on October 13, 2011 by Eastwood Eagles | Comments Off on UNICEF Penny Drive at Eastwood! Our Early Years Team wants you to know about our penny drive for UNICEF! Please read the attachment. Comments Off on UNICEF Penny Drive at Eastwood! The City (Cheswick) Division Meet @ Malden is canceled for tomorrow Friday, October 7. The Park is far too wet and the individuals running the park don’t want anyone in certain areas because of the flooding. As a result, the Raindate will be used and it will be on Tuesday, October 11 with all the same rules. They figure with all the good weather in the next little while, it will dry out the area for use. Note : We will attempt to hold events approximately 20 minutes apart. Please be prepared to run 30 minutes ahead of schedule. Thus, tell the parents this if they plan on coming to see their children run!!! Awards will be given out approximately 20 minutes after the last race of the day is complete. We will ask all teams to gather around the finish line after the last competitor crosses the finish line. Please remind parents / spectators not to park along Matchette Road or on the grass up in the park where the start and finish line are located. You can tell parents to park in the lot off of Malden Road or in the MicMac Park parking lot. Washroom facilities are located near the main parking area of the park and portable washrooms will be near the start / finish line.